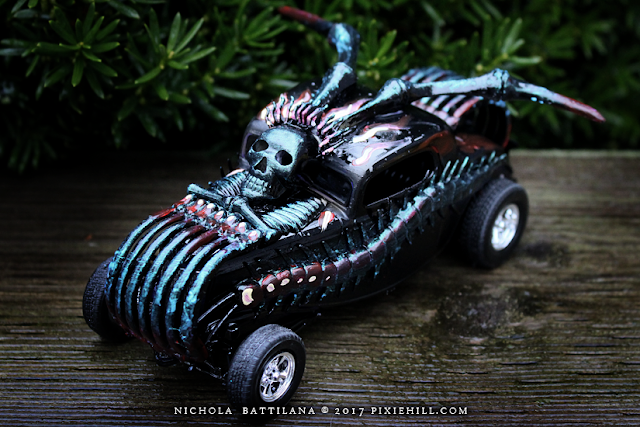 One of my very favourite projects from last year were the Mad Max hot rods built with my buddy Paula Mould. It's one of those projects that is just so much messy fun. 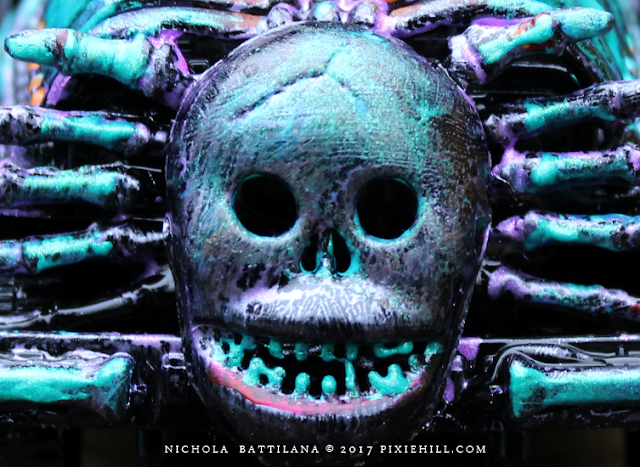 I mean you COULD be neat and proper and make something stunning... or you can let loose and just glue crap to other crap and have a grand old time doing it. There's Halloween junk all over the Dollarstore aisles and it made me nostalgic and inspired to revisit that project. 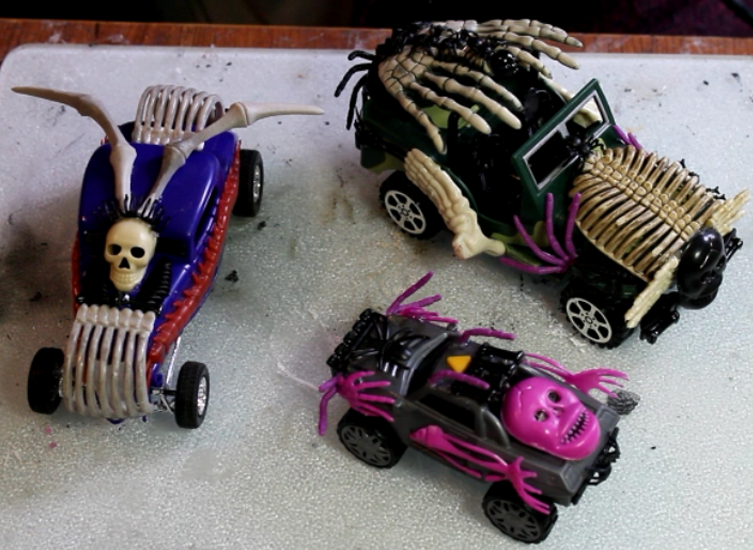 This time with a video tute (see below) for you to make your own monster machines. Since this is a dollarstore, stash busting project, it's not going to break the bank. 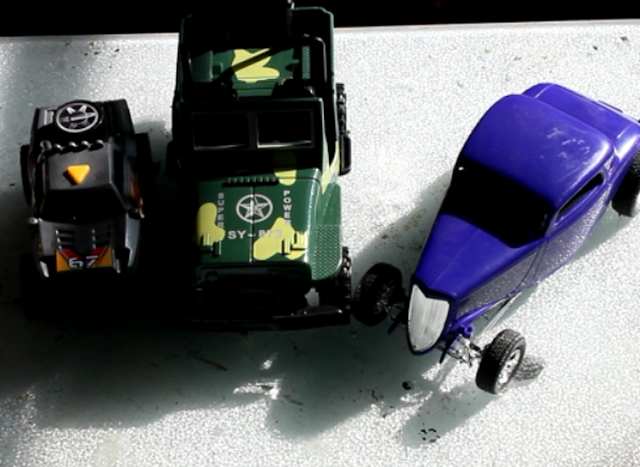 We're starting out with simple plastic toy cars and trucks. They check off most of the boxes for a kid friendly project. They're cheap, fun, neatness isn't exactly a factor. You WILL need to supervise/modify the project depending on age appropriateness (i.e. glue guns are the devil) but it's do-able for and little hotrodders you know. 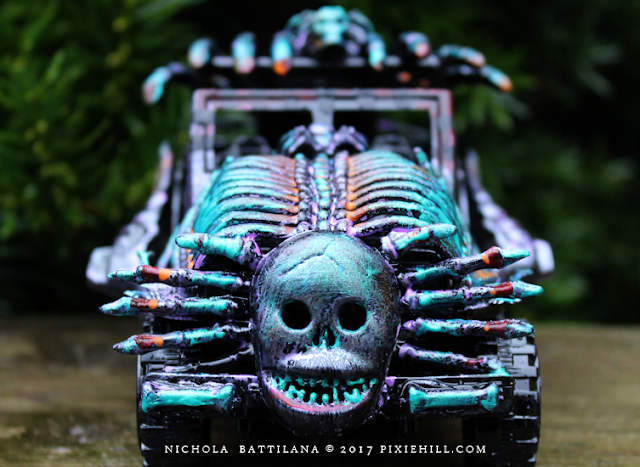 I've just used my trusty old hot glue gun for this project. If you want something that can be handled (crashed? raced?) and remain somewhat intact, you'll need to invest/experiment with a better method of adhesion. Or, you know, let them be the $3 works of art they are and just enjoy the destruction. Toy cars: trucks, busses, boats, planes... whatever strikes your fancy! Acrylic paint: I mostly used a product from Colourarte called Silks Acrylic Glaze It has a nice pearlescent finish and it was in my stash. Metalics looks super cool. GLUE: I used hot glue because it's fast and easy. Do what works for you! That's it weirdos! 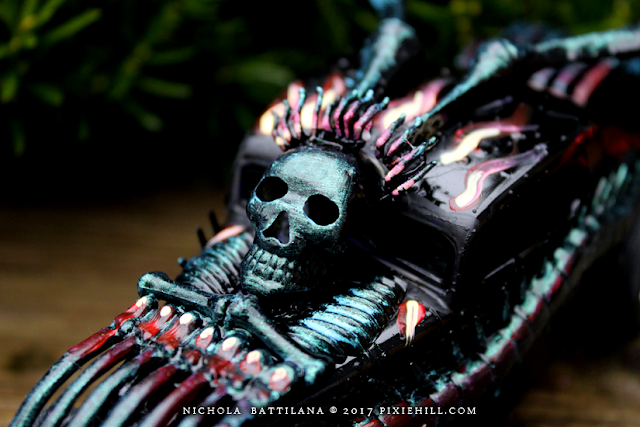 Go make something hotroddy! Here's how to put them together. Halloween is just around the corner so I thought that this month I'd make something spooky for that sweet holiday. 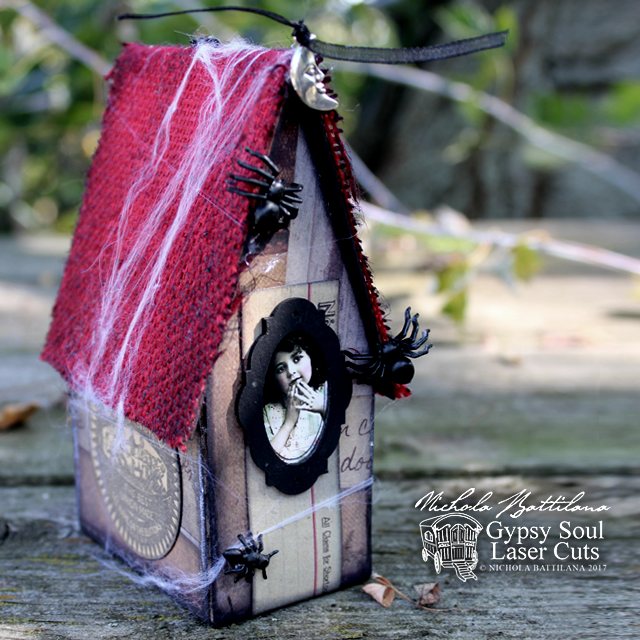 Using products from Gypsy Soul Laser Cuts, Canvas Corp and 7Gypsies. I've used the Cabana Row Houses as my base. 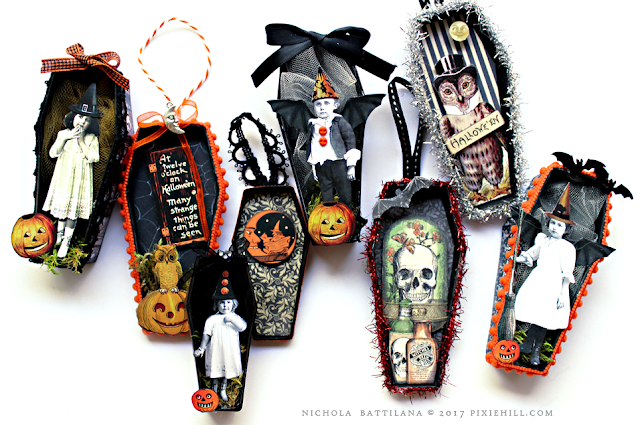 There's 5 in the set and so you can create quite a nice little haunted neighbourhood! 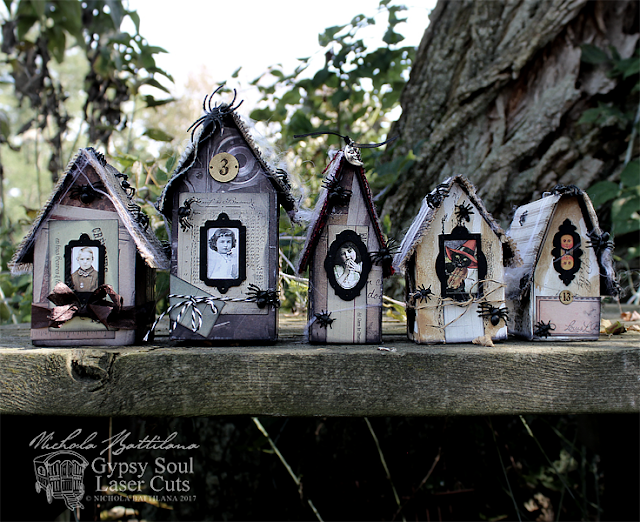 Some of the houses are covered using papers from 7Gypsies. 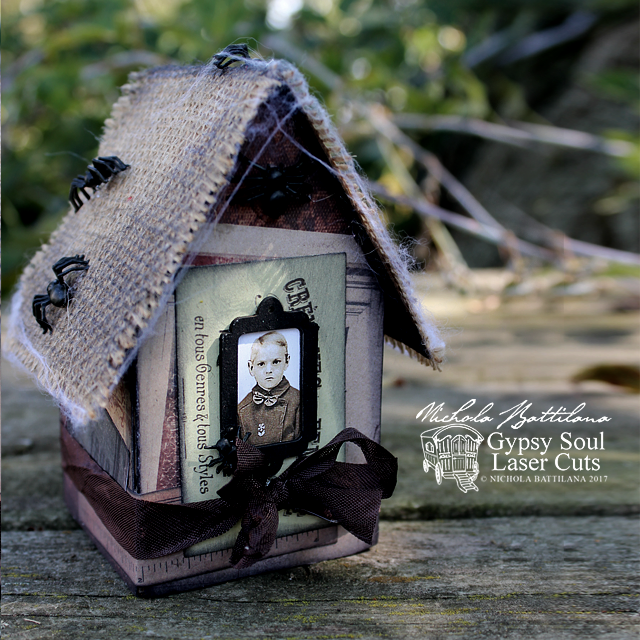 Some are simply painted white, decorated with Architextures™ Parchment Rub-Ons and then distressed. 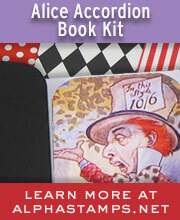 There are plenty of embellishment opportunites. I've used Faux Metal Number Plates 1 to 25 but don't forget the larger Faux Metal Number Plates and Gears Shape Set would be super cool for a steampunk haunted neighbourhood. Go check out all the shapes available at Gypsy Soul and I'm sure you'll find some inspiration. 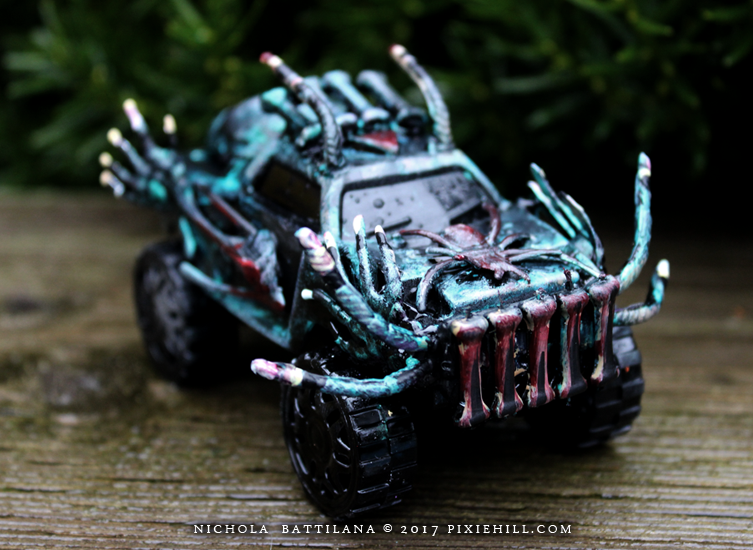 For a final touch I've added plastic spider and ants from the halloween aisle at the dollar store. 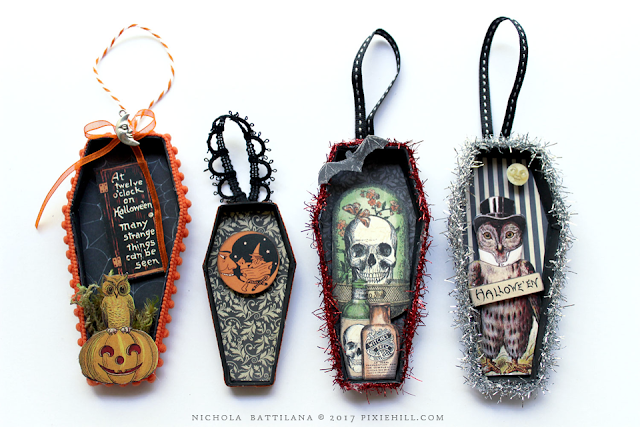 And here are the goods I used in making my own little spooky neighbourhood. 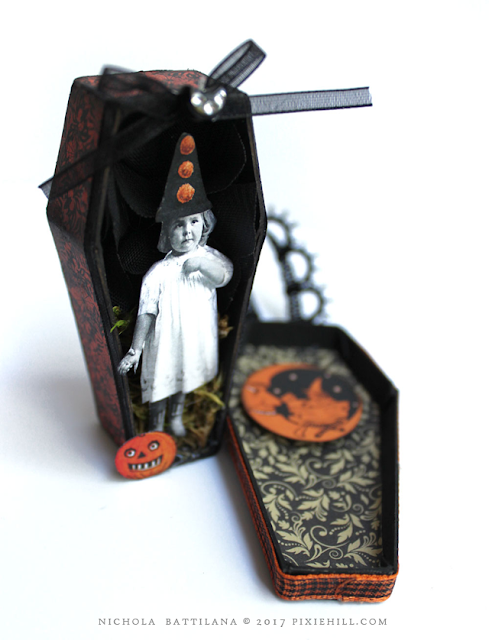 I was pleased to find a Half Scale Coffin with Lid in my AlphaStamps design kit this month. 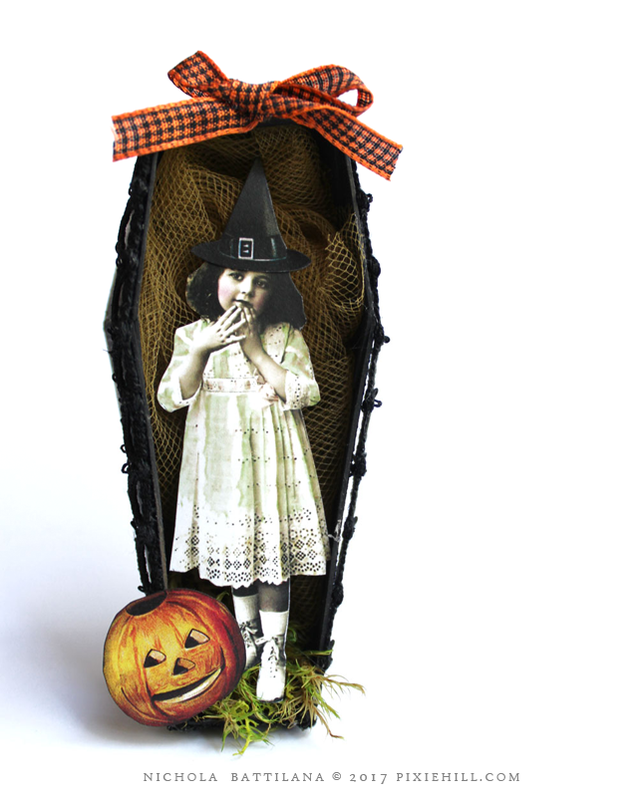 I actually had a few 4 Inch Coffin Boxes on hand already, but this smaller version poked me in the ribs and prompted me to finish up all those bits and pieces. I am totally for making materials stretch and using every bit and bob. So I decided to use the box part of these coffins as a sort of shrine, and the lids as chunky tags. Two projects, one product. This also means no fiddling or fuss to ensure the top fits perfectly with the bottom. Huzzah! 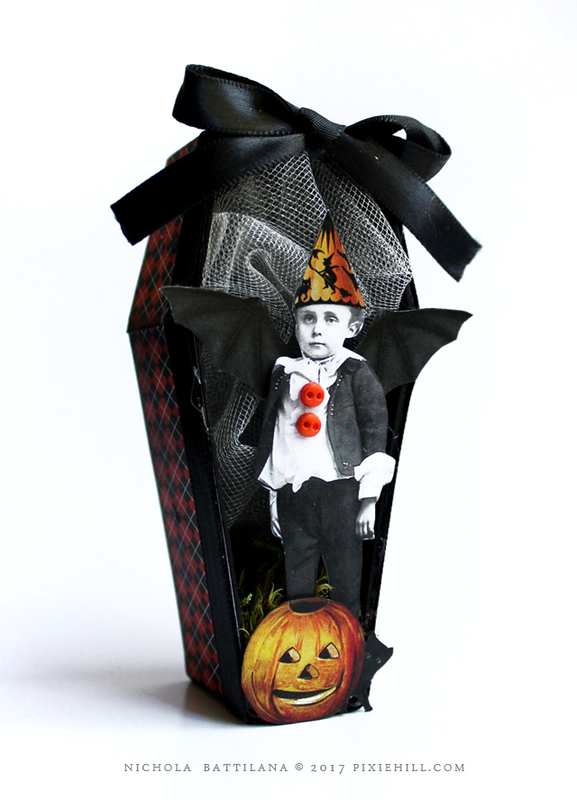 For the shines... just embellish the exterior, fill with tulle, add a little dude like this guy from Little Darlings Collage Sheet and gussy him up with some dodads from the Halloween Dress Up Half Sheet. A small bit of moss tucked into the bottom will help your wee person stand sturdy. The tags are super simple too. 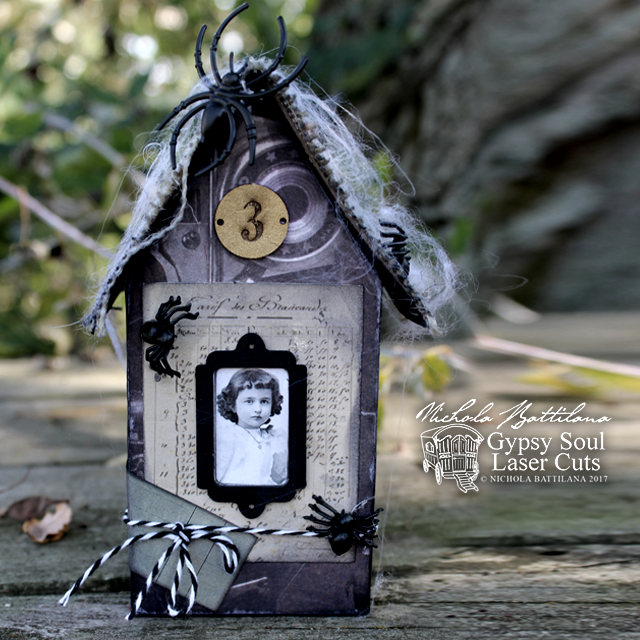 Assemble, cover exterior, add some trim and some cute Halloweeny images from Halloween Clock Spinners Collage Sheet. Attach a little loop of ribbon and you're ready to go! I've got a super duper fast video of the assembly of the tag on the far left above if any of that isn't clear. Here's the list of goodies I used for making these cute Halloweeny dodads. And here is eveything in one spot for your convience.